The Hunter. The Forest. The Seneca. Master the hunt with the Power of Air! Seneca Air Rifles bring the power you need for decisive takedowns with airguns that fire a variety of ammo including round ball, flat head, No. 8 shot, and even arrows! Built for thoseat home on the trail, Seneca's elegantly styled air rifles harken back to the golden age of the hunt. With etched actions, superbly crafted hardwood stocks, and stunning attention to detail--you'll be in love the first time you look down the sights. Take part in the chase. The wilderness. 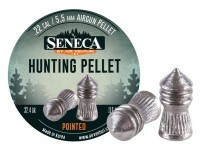 The thrill of the hunt---with Seneca. 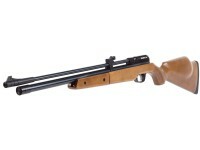 Seneca Sumatra PCP Air Rifle: Here at Pyramyd Air our biggest Seneca seller is not the biggest caliber! Available in .22 and.25 the Seneca Sumatra dumps up to 78 FPE into your targets whether paper, pest, or small game. Choose your preferred setup with a compact 190cc carbine or the 500cc rifle for more shots. Each Sumatra comes with 2 magazines and features 13 adjustable power settings to find your perfect shot speed. Seneca Dragon Claw PCP Air Rifle: At .50 caliber, the Dragon Claw gives you the power you need for taking medium to large game. Available in 244cc or 500cc launch round ball, flat head, hollowpoint rounds, and Air Venturi Air bolts. 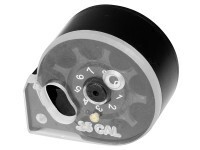 Shooters can expect over 670 fps and 230 FPE of penetrating power. Want the Ultimate Dragon Claw experience? Pick up the Ultimate Hunters kit for a scoped version of this big bore with a 4-12x40 AO scope, .50 Air Bolts, Quiver, Bipod, and .50 caliber ammo. Seneca Recluse PCP Air Rifle: This high-powered PCP sends .357 ammo downrange at speeds exceeding 980 fps and delivers 150 FPE of knockdown power. With an etched action embossed with the deadly Recluse spider, choose the 240cc or 500cc if you want more shots. 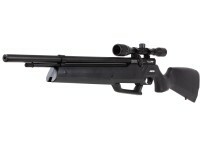 This air rifle is available in an Ultimate Hunters Combo that includes the Mantis 4-12x40 AO scope, .35 caliber Air Bolts, Quiver, Bipod, and .357 caliber ammo. Seneca Wing Shot II Shotgun: The .50 caliber Wing Shot II's smoothbore barrel grants the most options for ammo choices. Depending on your preference, the Wing Shot II can be a shotgun, a rifle, or a high powered bolt-slinger! This air shotgun features a ventilated rib for easy target acquisition. The Wing Shot II Ultimate Hunter's Combo includes the Mantis 4-12x40 AO scope, .50 caliber Air Bolts, Quiver, Bipod, .50 caliber ammo, and 50 No. 8 shotshells.